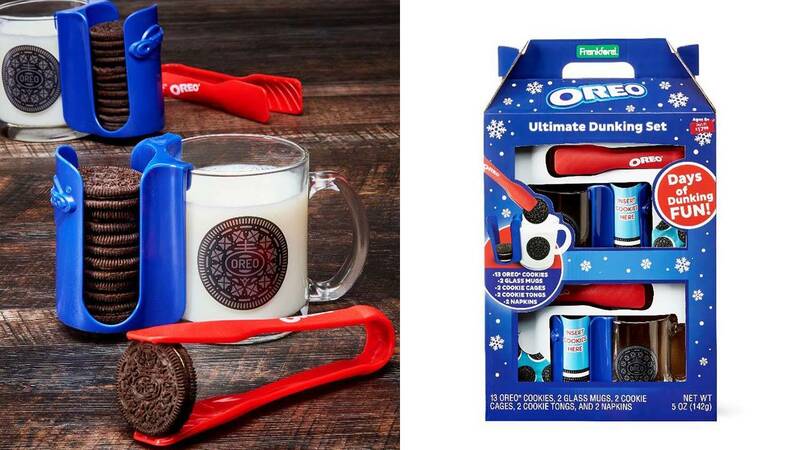 Oreo Ultimate Dunking Set, as seen on Walmart.com for $17.98. HOUSTON - Cookies and milk can be a messy proposition, especially if those cookies are Oreo cookies -- but not anymore with a kit that aims to bring your dunking game to a new level. The Oreo Ultimate Dunking Set comes with 13 Oreo cookies, two glass mugs, two cookie “cages,” two cookie tongs and 2 napkins for “days of dunking fun,” according to the box. We’re not sure if the person who wrote the box text has ever eaten Oreos because “day of dunking” fun is perhaps more accurate with only 13 cookies in the box. But that could easily be fixed with a trip to the grocery store to refill those cookie cages. The idea is to hook the cage filled with Oreo cookies on the side of the mug, dunk your cookie in using the tongs, and then -- without the usual fishing around in milk with your fingers -- lift the saturated cookie out. The set is $17.98 at Walmart, but has been spotted at Rite Aid, too.